But life being a growing and changing thing like it is, I’ve moved here, and the Gomers home base has moved to Facebook. If you’re a Third Day fan looking for other Third Day fans, check out the Gomer family. They’ll make you feel welcome and loved. All that to say this: I turned on my radio this morning and Discover the Word was just coming on KHCB. This show is three friends sitting around a table and talking through a Bible study. Their latest study concentrates on sorting through some things in the Bible that may be confusing. Today was the third and final part on the story of Hosea and Gomer from the book of Hosea. The thing that is confusing about this book is why would God ask a prophet to marry a prostitute? Not a repentant prostitute, but one who still had ideas of continuing her lifestyle, married or not? But God, as always, knew exactly what He was asking Hosea to do. He wanted Hosea’s love for Gomer to reflect His love for Israel, who were prostituting themselves with other gods instead of loving God as their first and only love. It was God letting them see Hosea marry this unclean person who showed him no love or respect, yet he loved and cared for her. Then Hosea could say to Israel, “Do you think my wife is terrible?” and of course they would say, “Yes! You should stone her!” and Hosea could say, “God set this whole thing up to show you how you are treating Him!” and Israel would say, “Whoa…” You get the idea. You can listen to all three parts of the discussion of Hosea and Gomer on the Discover the Word website, but the part that will really touch your heart is the third and final part. Click the link and give it a good listen. (It’s only about 13 minutes long.) You might need a tissue or two when you hear how much God loves you. It’s an amazing story that will give you some insight into the depth of God’s love. After I posted my chocolate chip cookie recipe (below), my son J texted me, “Do we have the stuff to make cookies?” I thought that was quite the coincidence, but no. 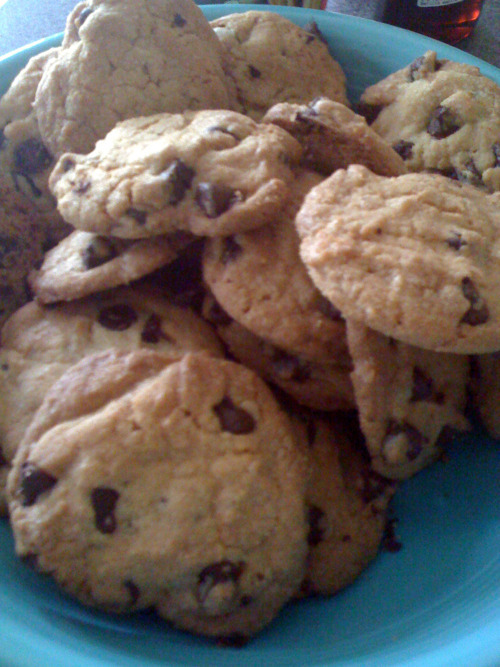 Seems J’s sweet girlfriend Andi read the blog, and it made her crave the cookies. So of course, J jumped to his feet to make some for her. No, seriously. He’s just that kind of boyfriend, and it thrills me no end! I’m happy to say both my boys have learned much from their father about how to treat their woman. They are such caring boyfriends. Makes me happy, and makes Hubby proud. So yesterday J made these cookies for Andi…and he let us have a few. They are so big and fluffy, I just couldn’t pass them up this morning. Now Andi and I are wondering if this would work for other things, like say I blog about ironing. Andi reads it and says, “Sigh, that reminds me. I have a few shirts I need to iron, but I just haven’t found the time.” Will J jump up and do it for her? Never underestimate the influence of a good woman, nor the willingness of the man in love with her. If there’s one thing I can make really really well every time, and there’s really only one thing, it’s chocolate chip cookies. I get a lot of compliments on my cookies. People seem to think they are something special. I started making them when I was a teenager, and taking them to rock bands that I liked. I still do that from time to time. Mostly I make them for my kids…and myself. To tell the truth, our favorite part is the dough! When I started making them for my family, I changed the two sticks of butter or margarine to one stick of Butter Flavored Crisco® (both equal 1 cup). The Crisco fluffs the cookies up quite a bit! Dirty Soda Cans Hazardous to Your Health? 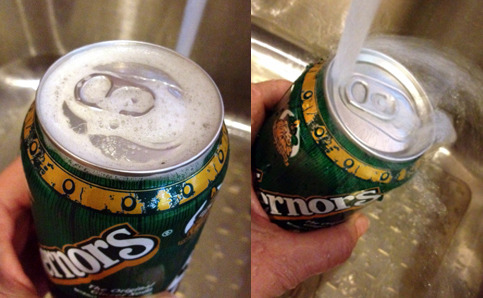 I was all set to blog about the dangers of drinking from soda cans before you wash them off. It has to be hazardous to your health to drink from a can after rats have peed on it and cockroaches have scurried across it in the warehouse, right? Turns out, there aren’t really that many dangers. I mean, it’s unlikely that you will die or even get sick if you drink out of a soda can that you didn’t wash off first. At least, according to two trusted sources, Snopes and Myth Busters. Even the Center for Disease Control and Prevention (aka the CDC) don’t have anything on their site about what I presumed might be a health hazard. And that’s good. One less thing to worry about. I mean, I wouldn’t neglect at least wiping the top of the can off before I drank out of it, just to be safe. At our house, we keep the soda cans that won’t fit into the refrigerator on the floor of the garage. I don’t think there are many rats in our garage (I hope not!) but I know there are a couple of mice, and just possibly a few (dozen) bugs. And they might be walking across our soda cans when they take their midnight strolls. Maybe even stopping for a potty break atop one of the cylindrical aluminum insect outhouses. Even if our garage was free from creepy crawlies, it’s pretty dusty out there. So I wash the tops of my cans, and the side where my mouth is going to be, before I open the can, just for my own piece of mind. Even if it just gets the dust from the garage off, a little soap and water never hurt anyone or anything. Except…be sure to rinse it well before you open it. Last Tuesday I didn’t, and soapy ginger ale ain’t no good for nobody. Yuck.